At Camden Vantage, you are just minutes away from Atlanta’s trendiest neighborhoods of Midtown, Little Five Points, Old Fourth Ward, Inman Park, and Poncey-Highland, just to name a few. Conveniently located adjacent to I-75/85, our residents live in the middle of what’s really going on. Our walk score is an 88, giving you the freedom to explore your neighborhood on foot! The Atlanta Beltline is minutes away! Entertain friends, get some work done, or go out and play- it's your apartment, live well. Whether you want your own space or are all about sharing, our studio, 1, and 2 bedroom apartments have all the room you need! Every apartment comes with a gourmet kitchen featuring custom wood cabinetry with brushed nickel hardware, pantry, granite countertops, double stainless steel sinks subway tile backsplash and pendant lighting. Plus we've got walk-in closets and full-size washers and dryers. Our two rooftop terraces offer a stunning, panoramic view of Atlanta’s downtown skyline and sweeping cityscape. Plus we've got two saltwater pools with cabanas and a two-story high endurance fitness zone with cardio, interactive cycling, and free weights. We love your pets at Camden Vantage and welcome up to 3 per apartment. Enjoy many of local historical hot spots like Mary Mac's Tea Room, The Varsity, and the Fox Theater. Convenience is right around the corner with the Atlanta Beltline and get anywhere in the city that you need to go from I-75/85. Soak in some history at the MLK Jr. National Historic Site or get some fresh air at the Freedom Park Trail or Krog Street Market. We are a perfect location for students because we are only 2 miles to Georgia Tech and 3 miles to Emory University. In the heart of the city, we are only a few miles from some really great venues like the Georgia Aquarium, World of Coca-Cola, College Football Hall of Fame, Children’s Museum of Atlanta, CNN Studio Tours, Centennial Olympic Park, Philips Arena, Georgia Dome, Underground Atlanta, Ponce City Market, Historic Fourth Ward Park, Atlanta Beltline, etc. Come home to Camden Vantage where you will #LiveTheCulture. 2 miles to the Georgia Aquarium, World of Coca-Cola, College Football Hall of Fame, Children’s Museum of Atlanta, CNN Studio Tours, Centennial Olympic Park, Philips Arena, Mercedes Benz Stadium, Emory University Hospital, etc. Minutes to the Fox Theater, The Varsity, Mary Mac’s Tea Room, Underground Atlanta, Ponce City Market, Historic Fourth Ward Park, Atlanta Beltline, etc. Get the perfect spot! We have ample parking for our residents in our direct-access parking decks on a first-come, first-served basis for $100 per leaseholder. 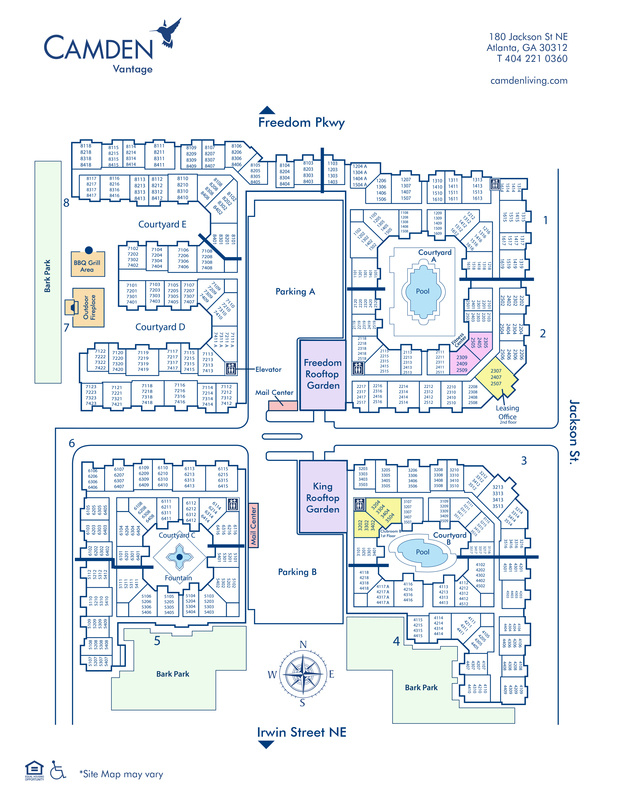 Visitor parking is located on the first floor of both parking decks.